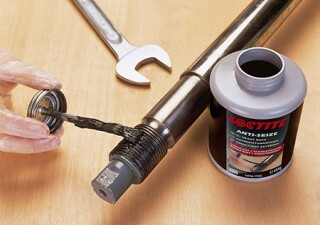 LOCTITE LB 8008 C5-A - Exclusive anti-seize lubricant in a brush top form with copper and graphite suspended in high quality grease. NLGI Grade of 0. LOCTITE® LB 8008 C5-A is an exclusive anti-seize lubricant paste in a brush top can, with copper and graphite suspended in a high quality grease. Applications include screws, nuts, pipes, exhaust bolts and brake calliper bolts. Resistant to extremely high temperatures (up to +980°C) and protects from rust, corrosion, galling and seizing. It has an NLGI Grade of 0.